This quilt has been in the works since April, I think! It’s fairly simple, and was pieced quickly, but I wanted to build my confidence before I loaded it on the long-arm. Looking at it now, I’m glad I waited a bit! I call it “Formation”, as I’m reminded of a flock of geese as I look at it, and the traditional name for the triangles is “flying geese” – fits right!? This is the first of many projects for Baby Lock over the next few years – I will let you know when a pattern is available on their site. I was initially inspired by Emily’s fabric – Technicolor is a fun and vibrant collection, and one of the prints is groupings of triangles. You can see it in my quilt if you look close. Then when quilting it, I took my time figuring out my plan, then went for it! 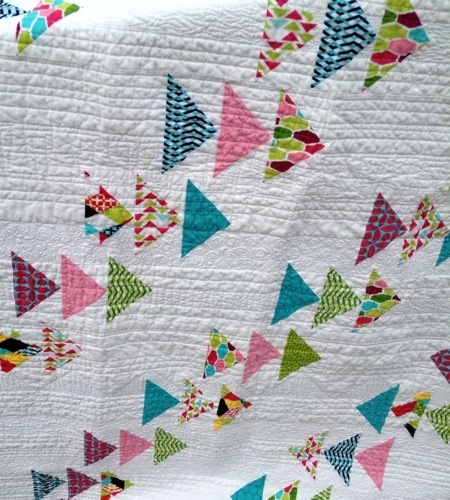 I used the channel lock on the long-arm to make the straight lines, and then added quilting between some of the lines. I had fun adding in different layers of texture, using the few patterns that I’ve been working to master. With my busy family and other commitments, time for quilting practice can be a little scarce some weeks. I did my best to keep the spacing between the lines random, not always easy, and tried to just have fun with it! The quilt itself is not serious, so why should the quilting! In other news – Joe and I are celebrating our 14th wedding anniversary today! Yay – kinda hard to believe how fast time goes! And just one more week until school starts; which is always bittersweet around here, even more so this year as Owen will join his sisters in a full day of school! I’m excited about the time to myself, and getting my lists under control, but know that transitions can be hard on everyone. Wish me luck! Happy anniversary, Amy and Joe! And, congratulations on the milestone that just got you extra hours in your day. You earned it, Amy! 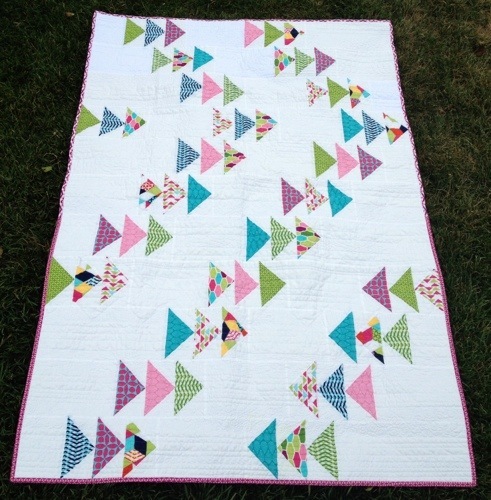 Formation is beautiful Amy – quilting included! Happy Anniversary. Such a beautiful quilt! Can’t wait for it to come out from BabyLock! And happy anniversary! Congratulations on the quilt and the anniversary! I love your quilt pattern. Looks easy yet stunning! Happy 14th wedding anniversary! Good luck with the school. More time for quilting always sounds fun to me ;). Beautiful quilt! 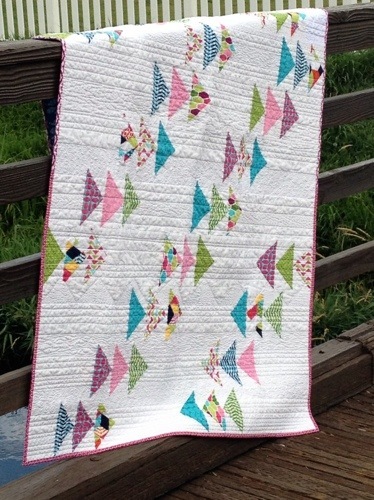 I love the colors, and layout, and quilting! Such a sweet quilt. Your quilt design is wonderful and the quilting is a lovely too. I love the formation of geese, and I love the bottom corner where there is a rebel group going the wrong way. I know what you mean about waiting for confidence to quilt–for me it isn’t on a long arm, but DSM. Still it is a new process. Yours was worth waiting for–turned out great. So…you have a new longarm? YAY for you! Hurrah for our side! The quilt looks great. IDK what kind of machine you have but my Gammill easily goes straight side-to-side and back-n-forth because of the table tracks (horizontal) and the carriage wheels(vertical). I only use the channel locks when I’m basting the batting & top (I float) so that I know without a doubt it’s straight. Love the new pattern! Enjoy all the quilting! It’s my best therapy! 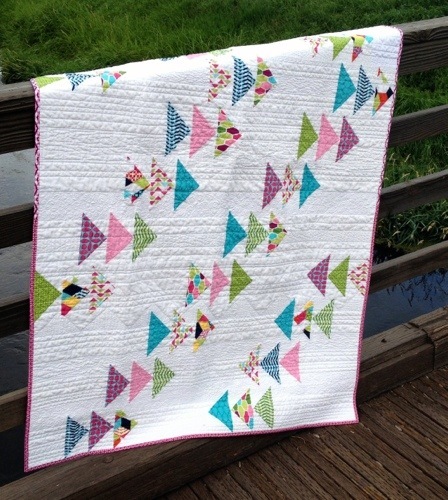 This is a very simple but nice quilt, love the colors you chose. I have never been a fan of FLYING GEESE but you make them look so good! Hi! I really enjoy your blog – I find lots of inspiration there. I was wondering when the Formation Quilt pattern will be available? Really love that design, my friend is looking forward to the birth of her first Grandson and this would make the perfect gift. All the best. I just love love this quilt. 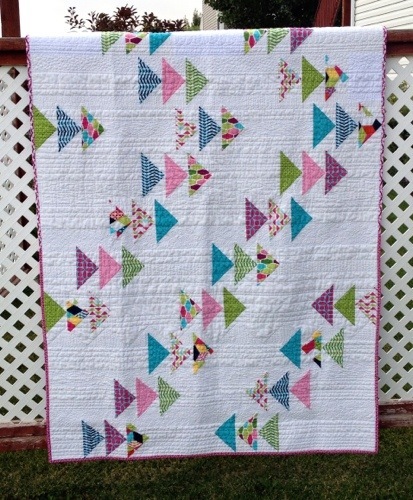 Do you have a pattern that I can purchase to make this quilt?